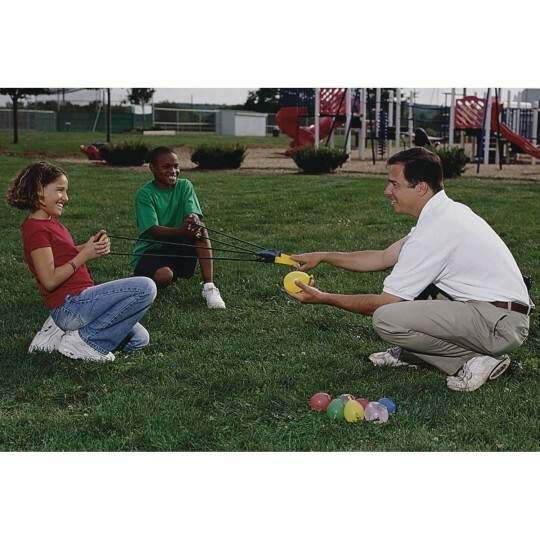 I use this product as a Adapted Physical Education Teacher and my students love it. I promotes team work upper body strength accuracy strategy etc. It is a whole lot of fun and the kids continue to talk about it and enjoy playing any games that this piece of equipment is involved with. 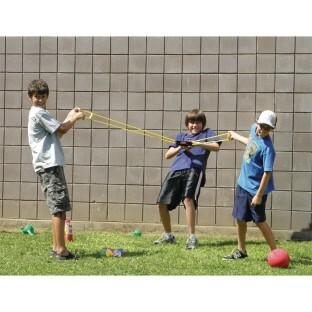 This is great to launch small balls beanbags and water balloons. We used it to knock the tower over for field day. I use this for cub scout packs just as a fun activity after the meetings. Even though it seems a little pricey the kids really enjoy this. It does launch objects quite well although I've never used water balloons have used small foam balls But most kids already know what it's for when I first break it out. Only have had this a a few months but considering how many times we have used this it seems durable. Don't recomend launching it the way that it is displayed in the website picture. Someone could get hurt that way. Definitely recommend letting older kids or adults hold the ends while the kids pull back and launch. Powerful launcher. FUN but needs adult supervision and WIDE OPEN SPACES! !